I met my husband on the first day of Freshers week at Leeds University in 1984, we were 18 years old. It was fate when after we got separated at one of the talks without having had chance to exchange addresses (this was long before the advent of mobile phones) that we ran into each other a few days later at the main entrance to the University. I was in a hurry to get to a lecture so gave Paul my address and he turned up on my doorstep that night! The rest as they say is history, we got married whilst still at University at the end of our second year, believing finding somewhere to live and employment would be enough the following year – my lecturers were not pleased. 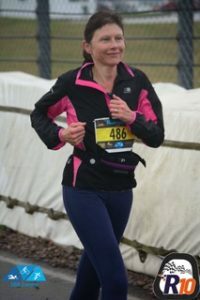 We were to spend 34 years together, 32 of these as man and wife and had two lovely children Carrie and Sean (who is running with me). Whilst it was far from easy at times as life never is, we were together and worked through each new challenge together and promised we would always be together! Until a devastating event on 27th July this year, we were living in Germany at the time Paul had taken a job with Siemens early 2017, after he had been made redundant from his previous company of over 17 years. A frightening prospect you may think, but he was ever positive and forward moving he never could sit still or keep his attention on something too long he was the problem solver the troubleshooter. He looked on it as his last hoorah an adventure. The children had grown up left home and had their own lives, and we had the opportunity to go and live in Germany for five years. Little did we know it was to be our last adventure. 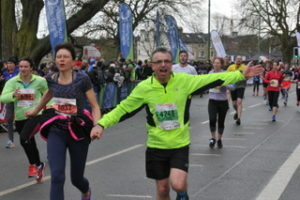 Paul had not been running for about a year because he had a trapped nerve in the back of one off his shoulders. 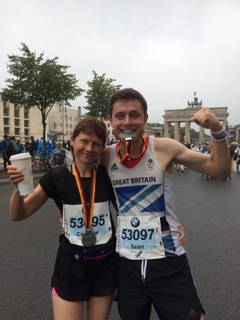 So I ran my first marathon in Berlin with our son Sean, then a second in Edinburgh hoping one day Paul would be fit to run again and we could carry on the journey together. On Friday 27th July 2018 Paul went off to work anxious and excited as he was giving a presentation in German that morning he had put a lot of effort into learning the language. He gave the presentation and received glowing feedback then went off to lunch with a friend in the staff canteen after which at around 1pm he had a cardiac arrest and had to be resuscitated and was sent to hospital. The strange thing is deep down I knew something was wrong, I was in the flat waiting for the rain to stop to go out and felt a bit odd. Two hours later I was contacted by Siemens. Paul was on his way to hospital in a life threatening condition. It was like a movie, this could not be true or happening, our son Sean was coming that night to spend the weekend with us. I was taken to the hospital by a colleague but it was not until the early hours of Saturday morning that we were allowed to see him, he had had heart surgery but there was a problem that we had never known he had, they were also having trouble stopping the bleeding from the surgery and kept asking us a lot of questions about this. Paul had never had an operation before. I knew he bled a lot from shaving cuts or when he cut his finger but that was all. I did not know as it later transpired Paul had Von Willebrands disease. They gave him twice over the weekend experimental blood clotting medication and told us each time it could kill him as it might stop the machine working that was acting for his heart. On the Tuesday they had to operate again problems were developing near his heart and lungs, the operation at first appeared to go well, but again a few hours after he started bleeding again by the Thursday morning August 2nd they told us they had done all that they could and we had to turn the life support machines of and let him go. Paul’s mum had only died the previous December at the age of 91 and his 87 year old father was still alive. Paul died on 2nd August 2018 at the age of 52 years! I believe it was the added complications brought on by the blood clotting disease and lack of knowledge that he even had it, was what killed him in the end. So I feel we need to know more about spotting the symptoms of haemaephilia-related problems or that more checks if possible should be done before operations to identify these risks which is why me and Sean have chosen to run for The Haemophilia Society as everyone is already aware of heart problems. It later came out Paul’s mum’s family lived in Southern Island and she lost touch with them during her life on the Isle of wight, that this is where the blood problems were traced back to. After talking to the family afterwards, my children have been checked and fortunately neither has the disease. I am running for Paul because he can’t (but know he will be with me in spirit) and ultimately to help prevent this sort of tragedy we later have found out he had small signs he had this problem but we never realised what they were and they were not identified. 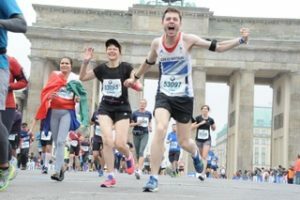 I have lost my soulmate and miss him so much running is my therapy although I am not fast It helps and if I can help others too – that means a lot to me.